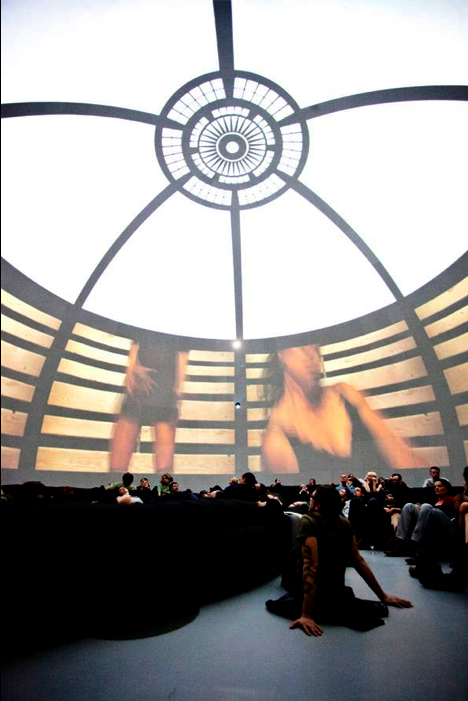 L’Écurie 360, an immersive video installation created for the dance company Manon fait de la danse was presented as part of SAT Fest at Société des Arts Technologiques, from March 21 until April 28, 2012. The project was created, as part of a Labodome residence, specifically for SAT state of the art 360 immersive environment. This piece is an adaptation of Manon Oligny’s choreographic installation L’Écurie. Interpreted by Karina Iraola, Anne Lebeau, Mathilde Monnard. Music by Gilles Brisenois. Graphics by Simon Laroche. Scenography by Yannick MacDonald.